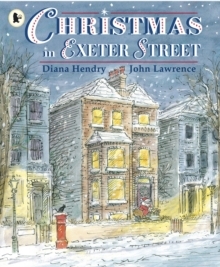 A charming story which captures the true spirit of Christmas and a must for every Christmas library!It's Christmas Eve, and the house in Exeter Street is full to bursting! There's a guest in every nook and cranny from top to bottom - and even a baby sleeping in the kitchen sink! Will Father Christmas be able to find them all? This gorgeously illustrated and atmospheric picture book about a house packed full of guests perfectly captures the sense of excitement and sharing that goes with this very special time of year.